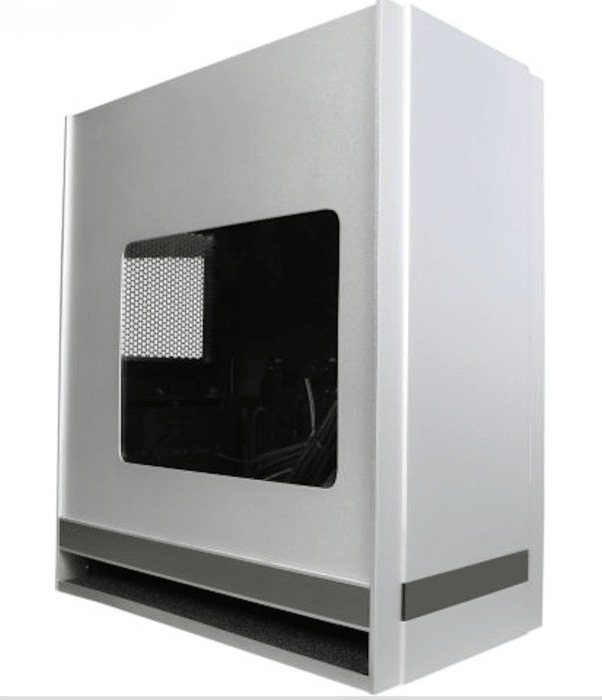 The Revolutionary SilverStone FT05 is the fifth generation Fortress computer chassis SilverStone has offered. This one offers the same 90° rotated motherboard that the Raven series offers but SIlverStone has completely removed the 5 1/4 inch drive bays that clutter so many chassis. You would think that computer case manufacturers would do two things, take all the Molex connectors out of a chassis and use 3 or 4 pin fan connectors and limit themselves to one or two 5 1/4 inch drive bays. Many enthusiasts completely do away with 5 1/4 drive bays preferring to digitally download or use USB drives to load software. We are somewhat behind the curve in getting completely rid of Optical drives in our test rigs so SilverStone was nice enough to include a Slimline (Laptop Type) DVD/CD burner that fits nicely into the Fortress FT05 Optical Storage for the Fortress FT05. The SOD02 is a beautiful little piece of hardware in itself and is a slot loaded DVD / CD burner that fits innocuously behind a small barely noticeable slot on the front of the FT05. 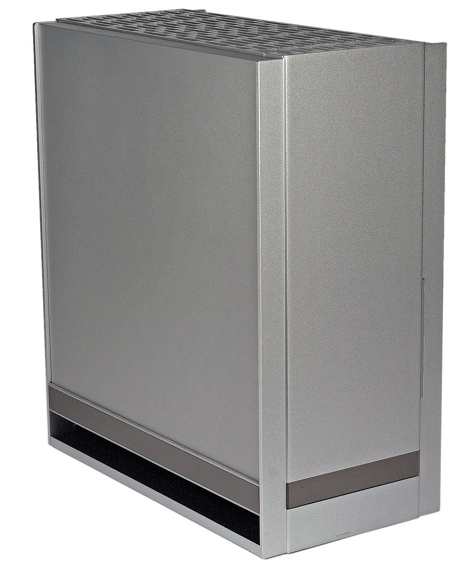 Our SilverStone FT05 is the silver Windowed variant but you can get black windowed or silver or black no window. From this angle you can’t even see the SOD02 DVD / CD Burner. The chassis has no front door and the exterior appears to be made almost entirely of cast aluminum. We aren’t talking thin aluminum we’re talking slap a zombie in the head and kill them thick Aluminum. The entire Chassis has a quality look and feel to it but is (like many SilverStone products) somewhat understated letting your components shine and not some blinged up kiddie chassis. Since it’s the same model we are throwing in the FT05 without side window for your lustful gaze. Now we know this is strange but when we got the SilverStone Fortress FT05 we donned a pair of white cotton non-slip gloves and completely, down to the last screw, stripped the chassis down to the bare component level. Took it completely apart then reversed the process. Every single part in the SilverStone Fortress FT05 is built to extremely exacting standards and it went back together without a hitch or so much as a seam mis-aligned. Every (approx 1/8″) plate slid back into place exactly as it came out of the box. That is an excellent indicator of well-engineered chassis. The SilverStone Fortress FT05 is an Elegantly built and engineered chassis that is sure to turn heads.